First up, fun fact! Did you know that “Klei” rhymes with “play”? I didn’t and had been rhyming them with “sky” all this time until a random google search set me on the straight and narrow. Klei have been around since 2005 and have produced some great titles, such as Eets Munchies [Steam] and the Shank games [Steam: 1, 2]. But they are probably best known for the masterpiece Mark of the Ninja [Steam, GOG]. More recently, they met with critical acclaim for Don’t Starve [Steam, GOG] and of course their latest offering, still under development, Oxygen Not Included [Steam]. Klei have been very good to us penguins over the years. Only two of their games are unavailable for Linux, namely their beta FPS platformer, Hot Lava [Steam], and their yet to be launched new IP, Griftlands [Steam]. There’s no news on the latter yet, but just last month the developers updated us on Hot Lava, claiming that while there were no dates yet, the Linux builds were being worked on. 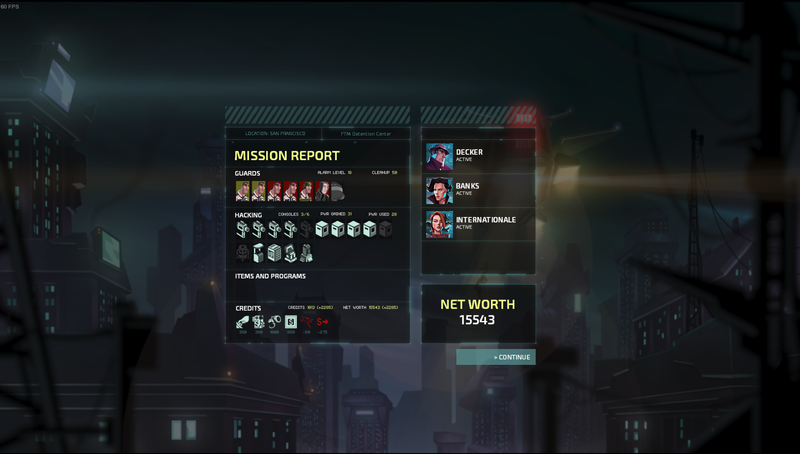 As for Invisible Inc itself, it was released in May of 2015 and met with critical success, but only limited commercial success. Still, Klei attribute a lot of that critical acclaim to their Early Access model. When Eurogamer interviewed Invisible’s lead designer, James Lantx, he noted that the original concept was very, very different from what was eventually delivered. He praised the EA model for helping to mould a game that he was pleased to release as Invisible Inc.
You’re the unseen “Operator” for a futuristic international spy ring dubbed “Invisible”. During what should have been a routine operation involving two of your best agents, your headquarters is attacked by unknown assailants and only your boss “Central” escapes with you. Central and you, along with the two agents who were on mission at the time, regroup in the organisation’s stealth jet and the game begins. Central was also able to retrieve the organisation's artificial intelligence, Incognita, before escaping. This was crucial, as Incognita is the very crux of Invisible’s ability to beam into a mission situation without alerting the guards. 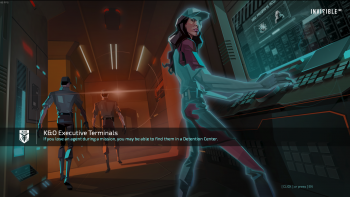 She’ll also pack some important hacking skills during missions which will help you take control of cameras, open safes, or even override sentry guns or bots. The game is driven by the fact that Incognita is required to enact any given mission, but because she’s outside of her mainframe, she only has around 72 hours of battery before she expires. You’ll fly the stealth jet from mission to mission, looking for clues as to who attacked you, and hopefully find a solution to Incognita’s dilemma while you’re at it. This is a turn-based squad-based stealth game. Some of the mechanics are reminiscent of XCOM, but there’s precisely zero, nil, no RNG (random number generation) at all. In fact, there’s no such thing as “health” really. Either you can take an enemy down with your attack, or he’s too armoured and you can’t. Similarly, if an enemy sees you during a turn and another agent can’t block his line of sight, or take him down before that turns ends, your agent is toast. One hit, one kill, both ways. 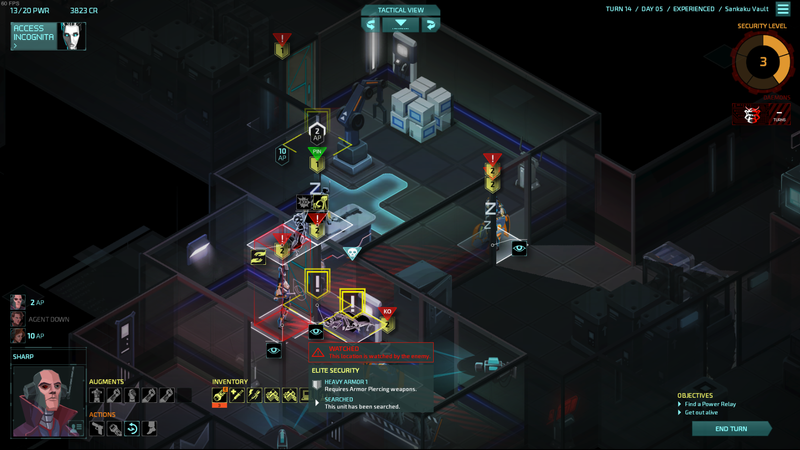 As a point of note, early versions of the game in Early Access did have both hit points and RNG, but it was later designed out of the game to give it a more tactical feel. This creates a fantastic tension to the game. Technically, guard routes are random, but even there, you have options to predict those routes (at the cost of 1 action point), so that your planning and strategy plays out exactly as you’d expect. Realistically, the only luck in the game is on the harder modes where guard patrols cross rooms and you might face a guard opening a door and walking in on your meticulously planned take down of the guard already in that room! Even there, though, the doors are well marked and you should be covering that possibility with an agent, or careful movement. If you do overlook a potential threat, you can rewind your last turn and try a different approach, or even retry the whole (randomly generated) level if required. Rewinds are limited to five in the “normal” mode, but you only get three at the “experienced” difficulty and level retries are also disabled on that harder game mode. 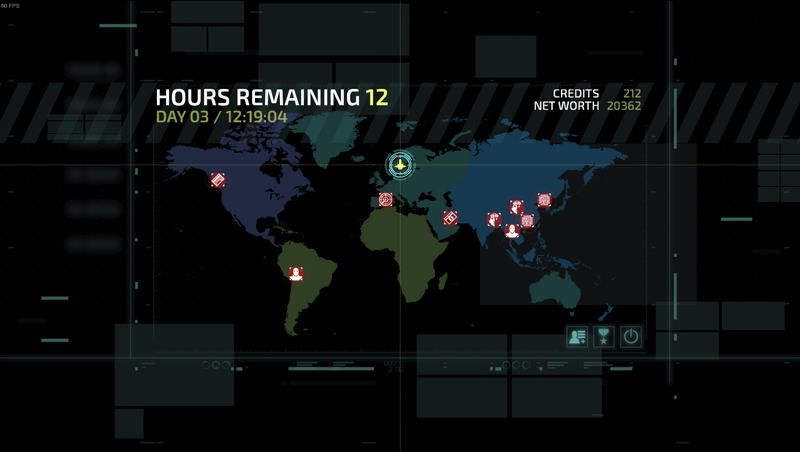 I haven’t tried any of the game difficulties above that - Invisible Inc doesn’t pull any punches in terms of difficulty. You might initially struggle, even at “normal” difficulty until you learn to appreciate how awesome your agents really are and start to push their capabilities, exploiting all the tactical advantages at your disposal. As usual, I made a video, tackling the initial mission to demonstrate some of the mechanics. I get a bit mixed up between the agent called Internationale and your AI, Incognita at times - apologies! Every agent has four attributes which you can power up with enough money. Speed affects movement, hacking affects how much PWR you retrieve from consoles which Incognita can use in cyberspace, strength affects carry space, drag speed and eventually KO damage and finally anarchy affects how much money you steal from guards and unlocks certain powerful tools later in the game. But those tools rarely come cheap and you’ll likely constantly struggle with the balance of agent upgrades vs keeping money in reserve to buy better equipment. You can also augment your agents with new abilities which can be bought or found on certain levels. Most agents start with one augment and can fit one more. You have to be careful about what augment you apply as these are permanent and can’t be swapped later. One agent, called Sharp, starts with no less than six augment slots available. Needless to say, he can become something of a powerhouse in later levels, if you’re lucky enough to unlock him in one of the detention centre missions! Each agent starts the round with 11 action points and you spend these in movement and attacks. The game is very forgiving beyond these two actions though and you can freely interact with objects, opening/closing doors and picking up or dropping corpses as often as you want. 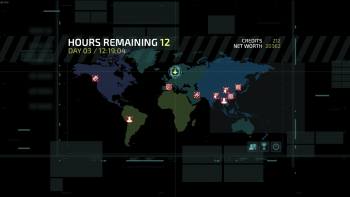 One additional, huge, key difference to XCOM is how your agents’ rounds play out. In Invisible Inc, you can switch between agents at any point in an agent’s round freely. There’s no concept of an agent’s round being “spent” except when their action points run out. This creates excellent tactical options. You can move one agent to a door, peek through it (at the cost of an action point), and see a guard and a camera. Interrupt the turn to use cyberspace to take control of the camera, back to the first agent to open the door, then use a second agent to move into the room and take down the guard. A third agent might step in and move the body, then the first agent, still at the door with some remaining points, might also move into the room one pace, close the door behind him/her, then take a cover position in the room and activate overwatch. It makes for very flexible turns, maximising strategic changes as new information becomes available. In terms of core gameplay, there’s honestly not much to complain about. Everything that follows is a bit of a quibble. In fact, I wholly endorse you skipping this section and going straight to the Summary. You won’t regret it! Okay, okay. So, the map can occasionally become quite cluttered. But you have the option of holding down the ALT key to see a tactical overlay that helps clear things up. It’s a shame the isometric view necessitates this, but even with the limited zoom in/out AND the ability to rotate the map by 90° segments, you’ll still need some clarification on the map and the tactical view does help here. I’m not a huge fan of the mechanic of forcing you to buy nearly all your equipment via Nanofabricators whilst in-mission. Later missions are fraught enough without having to plan these trips into your agent’s agenda, but it’s an absolute necessity. While you start with two agents, you can end up with as many as four, if you plan your missions accordingly, and it’s incredibly frustrating to not have any equipment for them, reducing them to spotters for your more ably equipped agents. As a side note, I once made a horrible mistake when I unlocked an agent called Decker who starts the game with a cloaking device (the one that I rave about in the video). I subsequently marched him into a guarded room only to discover that unlocked agents don’t recover any of their starting gear when they’re unlocked. This obviously makes a lot of sense, given that you literally “unlock” these agents from detention centres, but it really tripped me up on that occasion! Finally, the countdown mechanic feels a bit overplayed and artificial. Overplayed because regardless of how you work the missions, you’ll get to choose around seven or eight before the story moves on in any significant way and artificial because even if your plane is in the UK and you choose a mission in France, the timer will still inexplicably drop at least five hours instead of just two at the most. But as I say, these are minor quibbles. It’s a tense, challenging game and all the better for it. In short, you start with an engaging story which plays out through excellent voice acting and one of the most solid turn-based mechanics I’ve ever come across. Then throw in some character progression, a huge variety of equipment and augments and then combine with great audio and stylish graphics to enhance the tension and atmosphere. Finish up with Klei’s usual polish and quality and it’s clear that this is an absolute gem, not to be missed. I replayed the entire game twice more to make this review and loved every minute of it. In fact, in terms of my hours played, it’s almost identical to Flamebreak, just outside the top twenty in my Steam library of most-played games of all time (and as a thirteen year Steam veteran, that's a lot of hours)! You can pick up this awesome slice of gaming goodness on Steam, GOG or Humble. 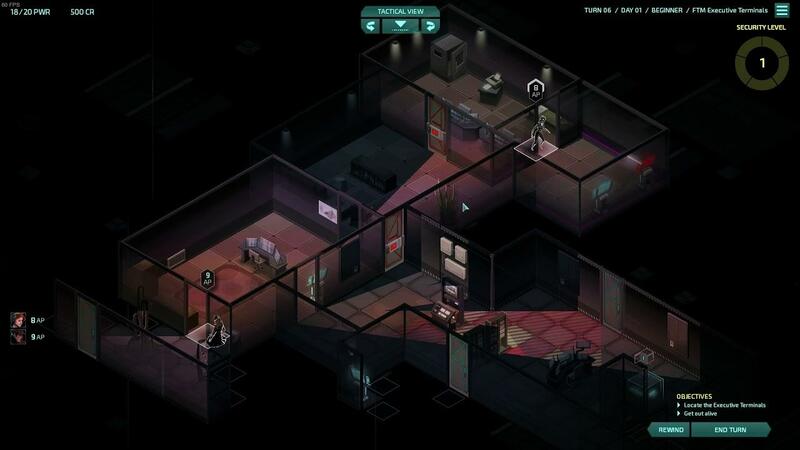 I can absolutely agree that Invisible, Inc. (I,I.) is a fantastic game. The lack of RNG means you generally have no one to blame for your failures but yourself, and makes it incredibly tactical—you'll always be able to know if something you want to do is possible or not (once you've played through the tutorial and learned how things work). I've always felt that the setting was a bit wasted, though. Much like many people wanted FTL to be more open instead of a railroaded drive to the end each time, I felt like the setting was perfect for a kind of open world freelance spy agency game. You've got a setting with multiple mega-corps all willing to hire you to sabotage their competitors, and it seems perfect for an open-ended game about running a spy agency, taking randomly-generated missions (much like the current game) and playing all the corps against each other. But instead, the opening cutscene has your organization in tatters and you on the run with a strict time limit at the end of which you either win or you die. I don't actually mind that in FTL because the ending is triumphant if you win, having saved the galaxy! But the ending in I,I. is really kind of a major downer from a story perspective (I won't spoil it though), and once you've seen it once you're like "Why would I want to play this again when I know the outcome?" Still, maybe I can hope for an Invisible, Inc. 2 (II: II? ) 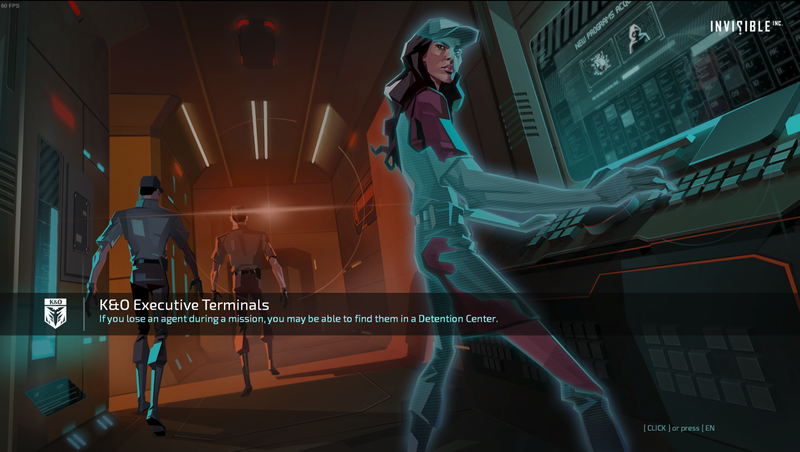 in the style of XCOM 2, set in that same world after the events of the first game but with a more open-ended and non-time-limited playstyle (maybe a sort of human resistance…?). That might ultimately be my biggest gripe with I,I., is the time limits. I know, they're there to up the tension and force you to keep moving, but I just don't enjoy that type of forced progression. If the time would simply not start ticking until you actually did something (rob a safe, knock out a guard, a camera sees you, etc.) that'd be great, allowing you to scout ahead and set up a plan rather than do everything on the run. (For those curious, the difficulty settings are VERY customizable and you can actually set up a playthrough this way if you want, but it's obviously not the intended behavior.) Ultimately that forced time-limit progression stress is why I've only played through it a few times. Quote One additional, huge, key difference to XCOM is how your agents’ rounds play out. In Invisible Inc, you can switch between agents at any point in an agent’s round freely. There’s no concept of an agent’s round being “spent” except when their action points run out. And having mentioned XCOM, I just have to point out that that's technically the case there too, it's just that units in XCOM generally only have 2–3 action points so there's generally less switching between them in the middle of a turn. I tried playing it on a tablet, and honestly I don't recommend it. While the mechanics work quite well, the smaller screen makes the already cluttered map look incredibly cramped, and it becomes much easier to make a fatal misclick. Seems good otherwise, although I'm no fan of the mission timer. Yep, the mission timer is a real love/hate relationship for me too, as I alluded to in the not-so-nice section, noting how hard it is to fit in NanoFab visits during an already time-limited mission. I don't think the game would have the same tension without it though, and ultimately, it does force you to take some risks which occasionally throws the cat amongst the pidgeons. When it goes wrong in II, it goes really wrong! I played a mission last night where I lasted a staggering 38 rounds - that's 8 rounds at the highest alarm level, which introduces a second and third enforcer (you get one at alarm level 5 too) AND pinpoints the location of all your agents! It's possible to survive these, but you do need a bit of luck if your game has gone off the rails that badly! I like to leave before hitting alarm level 5 usually! Agree about the ending and it does lend itself to a natural sequel, but two reasons I can't see that happening. First, I'm not led to believe that it did particularly well commercially, and second, Klei have never really done sequels since their early Eets/Shank days. I think the Eets sequel was due to moving to Steam, while Shank 2 was a result of Shank 1's success and likely because Klei were a smaller studio now. Since then, they've produced Mark of the Ninja, and Don't Starve without sequels and are working on finishing Hot Lava and Oxygen Not Included, while starting their new Griftlands IP. I can't see room for an Invisible sequel in that workload, sadly. Although I'd buy it in a heartbeat - loved the idea of making the game a more management-style spy thriller! Well . . . Don't Starve doesn't have sequels as such, but it's got plenty of additional stuff published after the initial game. Like Don't Starve Together and so on and so forth. 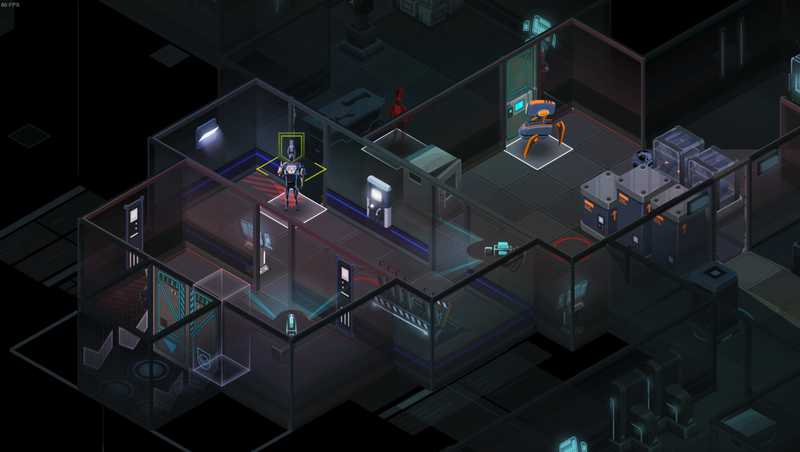 An open-ended campaign mode for Invisible, Inc. would perhaps be more like that, a DLC-ish thing rather than an actual sequel. It's a pity it didn't take off commercially, because I for one found it a lot of fun. This game is really fun, seriously, everyone should play it now. By blind coincidence I just played this for the first time on a plane flight; it's a great game. scaine I played a mission last night where I lasted a staggering 38 rounds - that's 8 rounds at the highest alarm level, which introduces a second and third enforcer (you get one at alarm level 5 too) AND pinpoints the location of all your agents! It's possible to survive these, but you do need a bit of luck if your game has gone off the rails that badly! I like to leave before hitting alarm level 5 usually! I'm suitably impressed! I think the worst I've ever gotten to was level 5, and that was already more way more than I wanted to deal with. Though probably my fondest memory of the game was the time I got myself into a really sticky situation, and had to use all three of my turn rewinds in a row before I finally figured out a combination of actions on the last one that got all my agents out safely—it was nerve-wracking and tense, but also an incredible feeling and it might not have happened without that pressure. scaine Agree about the ending and it does lend itself to a natural sequel, but two reasons I can't see that happening. First, I'm not led to believe that it did particularly well commercially, and second, Klei have never really done sequels since their early Eets/Shank days. […] I can't see room for an Invisible sequel in that workload, sadly. Although I'd buy it in a heartbeat - loved the idea of making the game a more management-style spy thriller! Yeah, I have no idea what the prospects of an official sequel are. Though it must've done well enough to warrant the Contingency Plan expansion it got, no? Regardless, it's not like the game mechanics are copyrighted or anything—now that we know just how fun a stealthy, turn-based game with almost no RNG can be maybe some other enterprising company can make the open-ended spy-agency-management game we'd like to see.